When it’s pouring rain in Canton, GA, the strength of your gutter system will be tested. If you notice yellow or brownish spots on your ceiling, your home may be suffering from a roof leak. Besides the obvious indicator of water literally dripping from your ceiling, the aforementioned spots could be signs of moisture infiltration. If you believe you have a roof leak, you can call Affordable Gutters Plus to schedule a service. Here is what you should do in the meantime. An accumulation of debris could alter your gutter system’s effectiveness, and cause a roof leak. If your home is more than one story high, it is better to call in a professional for gutter cleaning. If it is a single story, using a ladder to manually remove the debris, or making use of your leaf blower along with protective goggles can do the trick. The most important thing is that you prevent extensive water damage in your home. Grab a trash can, or other suitable bucket like object, and place it under the spot where water is dripping. While many YouTube videos can give you a general idea of what might be causing your leak, and what steps you need to take to contain it, a roof leak is really the job for a professional. If water builds up in your ceiling, the entire structure could collapse, destroying your ceiling and flooding your home. 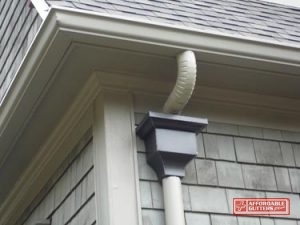 Posted in Uncategorized on June 26, 2017 at 1:36 pm by Affordable Gutters Plus LLC.